Call bets ("called bets" or "announced bets") in roulette are bets that cover sections of the roulette wheel. They are most commonly found on European and French roulette tables (hence why the names of most of these bets are in French). And 2 "variable" call bets that can cover different sections/numbers on the roulette wheel depending on where you place your bet. A diagram to show the wheel coverage and chip placement of the 3 fixed call bets in roulette. 1) Voisins du Zero (neighbours of zero). 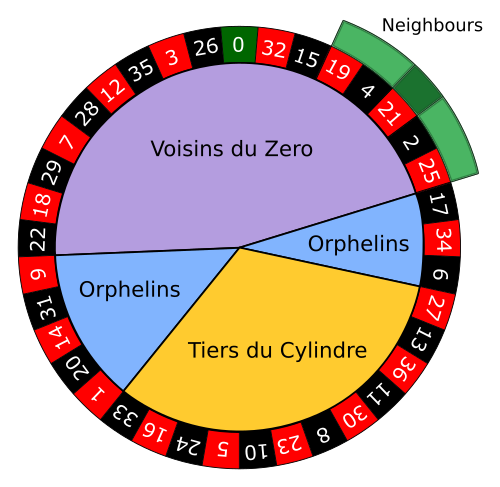 The voisins du zero bet covers 17 numbers on the roulette wheel that are closest to the green 0, which makes a lot of sense considering the name of the bet translates as "neighbours of zero". The bet covers the numbers between (and including) 22 and 25, going through the green 0 roughly in the middle. The voisins du zero bet covers the largest section of the wheel out of all the fixed call bets, as well as requiring the most betting units to make it. The bet uses a combination of split, basket and corner bets. It's also the only call bet that places multiple units/chips on bets. 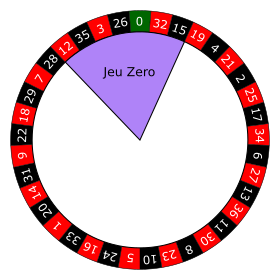 Jeu zero (jeu 0) is essentially a smaller version of the voisins du zero call bet. This bet covers the number in between (and including) 12 and 15. "Jeu zero" is similar to voisins du zero in that it allows you to wager on the numbers closest to the green 0, but it only covers 7 numbers and requires just 4 betting units. 2) Tiers du Cylindre (thirds of the wheel). The tiers du cylindre bet covers 12 numbers on the opposite side of the wheel to the voisins du zero numbers (roughly). This bet covers almost one third of the wheel exactly, so it's a good job that the bet name translates to "thirds of the wheel". This is the second largest call bet behind voisins du zero, requiring the use of 6 betting units. The tires du cylindre bet also only utilizes split bets, placing just the one unit on each. The orphelins bet covers the remaining 8 numbers that have not been covered in the voisins du zero or tiers du cylindre bets. The orphelins numbers fill the gaps between the two previously mentioned called bets. Seeing as these are the left over numbers that have been split apart (they do not cover a continuous section of the wheel), they are called the "orphelins" or "orphan" numbers. How kind. The orphelins bet is the only fixed call bet that places an overlapping bet on a number (17). An example of the numbers covered on a "21 and the neighbours" bet on a roulette wheel. 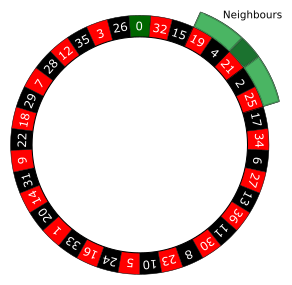 The neighbours roulette bet places a straight bet on the number of your choice along with straight bets on the two numbers either side (on the wheel). Therefore, 5 betting units are required to cover the 5 straight number bets. An example of a "final 4" call bet. Final bets (also known as "finaal" or "finale" bets), place straight bets on numbers that end in a digit of your choosing. For example, if you place a final bet on "4", bets will be placed on the numbers; 4, 14, 24 and 34. Final bets require either 3 or 4 betting units depending on what final bet number you select (e.g. there are only 3 numbers on the table that end in a 7, 8 or 9). Unlike the other call bets in roulette, the final bets do not cover continuous sections of the wheel. Below is a table that lists the 10 possible final bets and the corresponding numbers that chips will be placed on. Best online roulette casinos with racetracks. Are call bets available in online roulette? Yes. The majority of online roulette casinos offer "pro", "gold" or "expert" versions of their roulette games that allow you to make any of the call bets listed above via a built-in interface. Just browse around the casino lobby and you should find them. Some online casinos will also display a mini "racetrack" on their roulette tables, which can be used to help place call bets more easily during play. Alternatively, if all else fails you can always just place each bet individually to recreate your desired roulette call bet. That's not as much fun though. Roulette Games - Check out all the different types of Roulette games availble both online and in the casino. Roulette Odds - Find out which roulette games give you the best chances of winning real money.